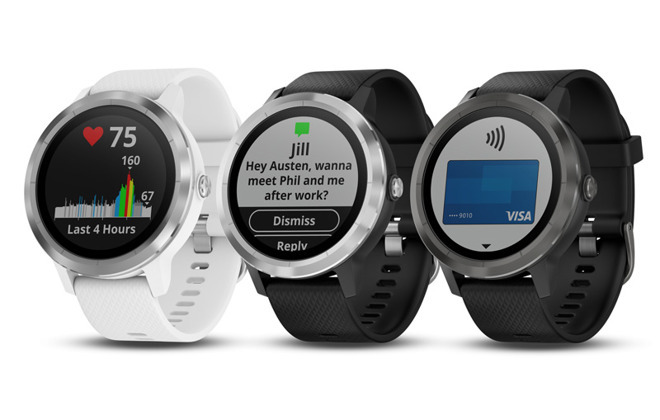 Garmin has announced a new iPhone-compatible GPS smartwatch, the vivoactive 3 —most notably the first device with Garmin Pay, adding to the growing number of NFC-based alternatives to Apple Pay. To use Garmin Pay, owners must first create a wallet through the Garmin Connect iPhone app and authorize one or more cards, as well as create a passcode. This code must be entered before a purchase once every 24 hours, or whenever the watch is taken off and put back on —this contrasts with the Apple Watch, which unlocks whenever its paired iPhone is unlocked too. Two color combinations —black/stainless and white/stainless —cost $299.99 each. A black/slate model is $329.99.